Many of the Z diagrams show the starter current passing thru the master contactor as well as the starter contactor, and I gather this is to allow for the possibility of the starter contactor welding itself shut. If that were to occur then the pilot can disengage the starter motor by turning the master switch off (having a "starter engaged" light and an e-bus alt feed would both be useful for this scenario). However, I see that Z-20 shows the starter current direct from the battery to the starter contactor and not thru the master. Z-20 is for a Jabiru system, and I have a Jabiru engine so I figure (no pun intended) that I could use the Z-20 arrangement, although I don't know why Jabirus would be different in this respect. So, here are my questions: How unlikely is a welded contactor? How well does the diode prevent this from happening? Is there a way to tell if the diode has failed open-circuit? Can’t speak for how common this is overall, but I’ve had a stuck starter solenoid on both my TC aircraft. Going from memory here but as I recall the diode is there to prevent arcing of the switch contacts controlling the solenoid and not the solenoid itself. I'm sure that that info is in the archives. Try a search for diode or diode and contactor to be sure. One way to test a diode is to remove it from the circuit. Then put it in series with a test light and battery. The light should illuminate when the diode is orientated one way and not illuminate when reversed. Trying to start an engine with a weak battery can lead to welded contacts. >>Trying to start an engine with a weak battery can lead to welded contacts. Yes… of the two occasions this happened to me, one was because of a weak battery. The other was caused by an intermittent dead short (yes!) in the starter motor. weld shut but it is pretty rare with the built in contactor IMO. essential. I would take another look at this if using a Li battery. takeoff)! Phooey on starter engaged lights. occasionally simply blow apart when shorted. why Jabirus would be different in this respect. tell if the diode has failed open-circuit? failure rate for the constellation of components. it more practical to go the FMEA route . . .
system's energy source is limited. source of engine driven power is one example. I've updated Z20 to reflect this configuration. was 10 years ago . . .
How well does the diode prevent this from happening? Is there a way to tell if the diode has failed open-circuit? can have a deleterious effect on contact life. 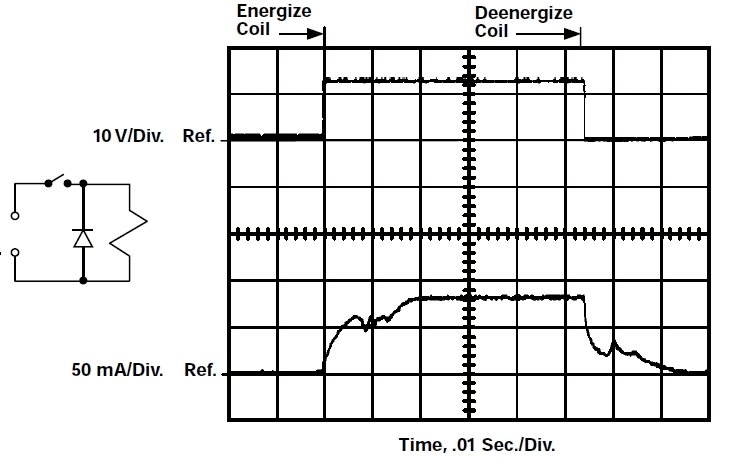 caused by addition of the simple catch diode. 'show me' back in the lab. fail, they'll fail shorted . . . not open . . .
and may even blow apart as noted by another Lister. You made a remarkable statement about weak batteries, starting, and contactor contact problems. I hope everyone reads your remark and remembers this potential problem. Too many try to do starts via a weak battery and cold engines. This will eventually do contact damage in the starter contactor.